There is something slightly unsettling about the The Stranglers "Black And White" album and the atmosphere that pervades it. It’s kind of like watching a particularly effective psychological thriller or horror movie. You know that feeling when, even after leaving the cinema, you are left with a lingering sense of dread and have that irrational urge to check under the bed before you go to sleep. It’s totally unique, a genuinely innovative and ground-breaking album with it's twisted time structures, weird angular guitar riffs and snarling vocals. There's that immensely powerful production and the iconic but weirdly compelling cover art....and that’s before we get to the bass! For "Black And White" must be the ultimate bass album with JJ Burnel in inspired form throughout. Instead of following up the commercially successful "No More Heroes" with more of the same, The Stranglers really went for the jugular with "Black And White". They were miles ahead of most of their contemporaries who were either imploding or churning out punk-by-numbers and produced this timeless album, in fact it's almost like it was beamed down from another planet. There was nothing to prepare you for "Black And White", probably only Wire and Public Image Ltd were making such similarly challenging music. Of course The Stranglers never get paid their dues - let's see how prominently they feature in this year's "40 Years of Punk" nostalgia-fest. Will they be taken seriously in the documentaries, features and exhibitions that are going to be filling our TV screens, media and galleries over the next 12 months or so? I very much doubt it. But then again, would us Stranglers fans have it any other way? The band have always thrived on being outsiders, they have survived the departure of not just one, but two lead vocalists and the semi-retirement of their legendary drummer Jet Black, to play packed out venues across the globe. The decision of the band to embark on an ambitious tour to play the whole of the "Black And White" album start to finish, proved that I wasn't the only one who always believed the album should be lauded up there with some of the greatest albums to have come out of the Punk Rock and indeed Post-Punk scenes. 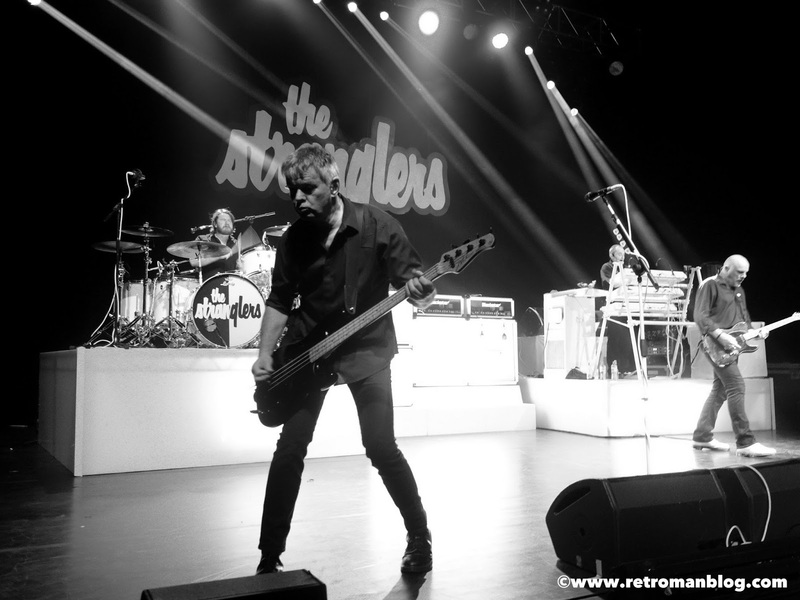 As the familiar strains of the "Waltz In Black" intro music fill the packed out Brixton Academy auditorium, The Stranglers take the stage and launch straight into the explosive album opener "Tank". We know what's coming but it still takes the breath away. The Stranglers always had a gift for writing evocative songs and "Tank" could not have been better named! Unfortunately, health issues prevent Jet Black from touring with the band, well he is fast approaching 80 years old, and his place behind the drum kit has been taken by Jim MacAuley who at first glance bears a youthful resemblance to Jet! Just as the addition of Baz into the line-up seemed to reinvigorate the band, Jim ups the energy levels even further and I don't think the band have sounded so fresh and exciting for many a year. Next up is "Nice 'n' Sleazy", the only single to be taken from "Black And White", and with it's skewed take on a Reggae rhythm and JJ's iconic leering bass-line it's another perfectly titled track. "Outside Tokyo" is a twisted Baroque styled waltz that slows the pace momentarily before "Hey! (Rise of The Robots)" crashes in. This is probably the closest the band get to sounding like a Punk Rock band; in fact it sounds like something you might have heard in the Roxy in 1976 with its quick-fire Clash-like "1977" guitar riff intro. It then canters along at a fair pace and is all over in two glorious minutes. It's a shame they didn't get a saxophonist on stage to try and replicate Lora Logic's inspired playing from the album itself, which would have been something special. Next comes "Sweden (All Quiet on The Eastern Front)" a song which was inspired by Hugh's time studying at Lund university which must have been boring as he claimed it was the "only country where the clouds are interesting". Although the band did film a humorous video for the song which you can see in the “Video Collection 1977-1982” it was somewhat surprisingly never released as a single over here despite it being one of the band’s, and certainly “Black And White’s” stand-out tracks. So, it remains in my mind the greatest single that never was, but should have been...! Well actually, I lie, a version was released as a 7” single but in Sweden only and it was entitled "Sverige" with yes, you guessed it, Hugh singing entirely in Swedish. Let’s just say that’s one for the die-hard collectors only and Baz wisely opts to stick with the English language album version tonight. "Toiler On The Sea" is again one of those wonderfully evocative songs, an epic seafaring tale made up of different sections similar to "Down in the Sewer" from the band's "Rattus Norvegicus" debut. You can really picture the grey skies bearing down on the rain lashed boat being tossed on dark waves as the metaphorical crew battle against the elements. It's this almost Viking inspired imagery that I can certainly see carried over into "The Raven" album that followed "Black And White" a year later. "Curfew" is a blistering, paranoid track seething with unsettling riffs, stabs of keyboards and the fear of unwelcome invaders with the power to "turn the day into night..." The next track "Threatened" is in a similar vein to "Curfew" with it's pumping and pulsing heart-beat drumming and it affords the bizarre sight of people all around me joining in singing such choice lines as "man killed by luxury, man killed by falling tree". "In The Shadows" with it's fuzzed beyond recognition bass-line was always the weak link for me on the album and tonight hearing it played live doesn't really change my opinion unfortunately. Dave Greenfield takes over lead vocals for the sinister "Do You Wanna?" which segues into the superb "Death and Night and Blood (Yukio)" and I must say the hairs on the back my neck stand up as the two songs collide. The lyrics point to JJ's fascination with the author and poet Yukio Mishima who committed suicide following a failed attempt to overthrow the Japanese government in 1970. This was another motif he was to carry on to "The Raven" in particular with the album track "Ice" and it's "die like cherry blossom" line and references to the Hagakure, the Samurai's spiritual and moral code. I wasn't sure if they would include “Enough Time” in the set list as it's a difficult enough track to get your head around as a listener let alone as a musician, but they manage the very weird time signatures and off-kilter riffs expertly. As the song slowly winds down the stage lights come on, the stage is suddenly awash in a blaze of colour and the band start the second half of the set with a stomping "(Get a) Grip (on Yourself)". What follows is an excellent pick of singles, classic tracks and a few surprises including "Walk On By" the cover version of the Dionne Warwick, Burt Bacharach song that was actually given away as a free seven inch single with the initial copies of "Black And White". There's quite a few tracks from "No More Heroes" including "Dead Ringer", "Something Better Change" and a blistering version of "I Feel Like a Wog" but there's only "Nuclear Device" from "The Raven". The sublime "Always The Sun" is played under a beautiful orange sunset light show and sounds superb tonight and a surprise "Princess of The Streets" from "Rattus" with JJ 's voice on top form. The older more familiar numbers are punctuated by a few songs from the last three Baz-era albums, "Mercury Rising" from the current album "Giants" and then "I've Been Wild" from "Norfolk Coast". One of the highlights is a superb "Relentless" from "Suite XVI" and "A Soldier's Diary" from the same album, which is a bit of a throwaway thrash. For me it wasn't the most inspiring selection of new-ish tracks when you think of the quality of some of the others they could have chosen such as "Unbroken", "Big Thing Coming" or "Barbara", but they seem to go down well with the majority of the crowd. Anyway, with a back catalogue of such diversity and quality as The Stranglers, they could have played for four hours and still people would be complaining they didn't play their favourite song! For the well deserved encores we get treated to "Peaches", "Hanging Around", "Go Buddy Go" and of course "No More Heroes". As I make my way out of the venue I make my mind up to go along to see the band in Reading a few days later as I just had to have another fix of "Black And White". I managed to make it to Reading Hexagon in time to catch the last half of The Alarm’s support set as unfortunately I completely missed them at the Brixton Academy show due to being trapped in a pub. I remember seeing them a fair few years ago when they released their excellent debut album “Declaration” and they were a blaze of rather large gravity defying back-combed hair-do’s and acoustic guitars. 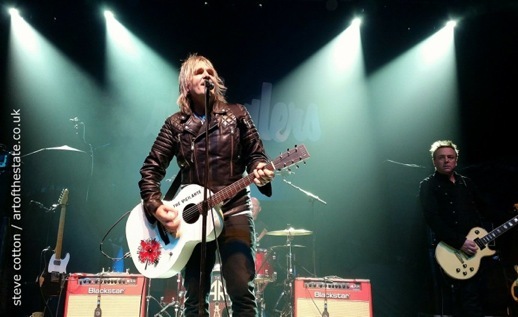 The Alarm nowadays are based around the main singer-songwriter Mike Peters, no other original band members remain but I do notice some familiar faces in the new line-up. On the drums is Smiley who has played with Joe Strummer & The Mescaleros and From The Jam, Guitarist James Stevenson was in Chelsea, Gen X and Gene Loves Jezebel and then on the bass there’s Craig Adams. Blimey, Craig Adams…I remember seeing him at the Electric Ballroom way back in 1984 when he was in The Sisters of Mercy. Craig then went on to form The Mission with his Sisters colleague Wayne Hussey and has played with The Cult and also in later incarnations of Spear of Destiny and Theatre of Hate. There’s also a keyboard player and I’m rather disappointed that I don’t recognise him to complete the full set! Mike Peters still has that trademark back-combed hair and is a passionate and charismatic front-man who really engages with the receptive crowd. To be honest, musically it’s not my thing, but they play tight, anthemic folk-rock songs which to me sound a bit like early Bruce Springsteen and it’s all pretty enjoyable stuff. An extended version of “Spirit of ‘76” really builds up a head of steam and “68 Guns” is still a bloody great sing-along song whatever way you look at it. Mike has been battling lymphoma and chronic lymphocytic leukemia since the mid-90's and he explained about his "Love Hope Strength Foundation" charity which will have a stand at all the dates throughout the "Black And White" tour. You can find out more details about their fund raising events at the official web-site here. The Stranglers take the stage and run through “Black And White” again and it seems even louder than Brixton with JJ’s bass shaking the Hexagon’s foundations. Tonight there’s more between song banter than at the London show with Baz complaining about Reading’s one-way system and the perils of driving in the town before launching into “Walk On By”. He then attempts to play the TV theme tune to the Snooker and explains “I'm afraid that's what the Hexagon means to me!” and then we get told how bad our football team is too. This slight on Brian McDermott's Blue & White Army elicits a few good natured cat calls in response, “Sorry I can’t understand what you are talking about” he jokes in his strong Sunderland accent before accusing us of being Cockneys in a passable Danny Dyer voice. “OK, this is the bit where you're meant to call me a Northern monkey!” Nobody does, he’s a big scary chap is Baz! It’s hard to believe that he's been in The Stranglers for sixteen years now and I really do think he has played a huge part in the resurgence of the band's popularity. There's no doubting that Hugh's initial replacement, Paul Roberts, did divide opinion among Stranglers fans (me included!) so when Baz took over and the band reverted to their traditional four-piece line-up, they seemed to rediscover their 'mojo' and have never looked back. It was a bit of a shame that the pick of classic tracks in the second half of tonight's show is exactly the same as at Brixton as I was hoping to hear a few more old favourites. In fact we actually get one less as "Dead Ringer" is replaced by an admittedly brilliant version of “Norfolk Coast”. I'm pretty chuffed though as I think it was probably this one song, when it appeared as the opening track on the 2004 album of the same name, which might well have been the catalyst for a lot of people to start taking an interest in the band again after Hugh’s departure. After all, with that crunching bass intro and the swirling keyboards it has all the hallmarks of that classic and much-loved Stranglers sound that had been missing for quite some time, maybe since “The Raven” album at least. We get "Freedom Is Insane" from "Giants" and "Lost Control" from "Norfolk Coast", I'm much happier with the choice of newer songs tonight. There’s only two encores though, “Go Buddy Go” and “No More Heroes”, which I suppose is more down to the stricter live music curfew at the Hexagon, but nobody is complaining, it’s another superb show and everyone piles out into the cold Reading air with beaming faces and great memories of seeing a band that is, against all the odds, still on top of their game. I’ll keep my fingers crossed in the hope that the band decide to do a similar tour for “The Raven” sometime in the near future, now that would be something really special too. Thanks to Steve Cotton for contributing the excellent photos from the Reading Hexagon as credited above. You can check out more of Steve’s work at his “Art of the State” web-site. For more photos of both the Brixton Academy and Reading Hexagon shows please head on over to the Retro Man Blog Facebook page here for access to the photo albums. While you are there, if you like what you see and want to be kept up to date on future features, news and reviews then please give the page a “Like”. 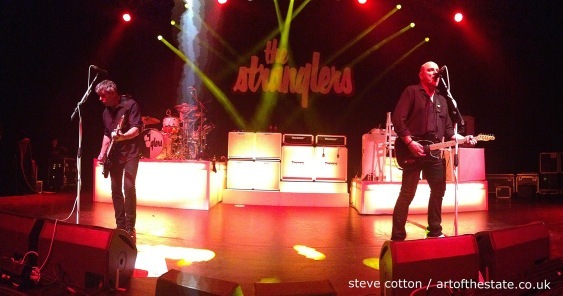 Up to date information on The Stranglers can be found at their official web-site.